The Narrowing the Gaps Pedagogy Project: Which one of these best shows the meaning of...? Which one of these best shows the meaning of...? Not a very snappy name for a T&L tool, but extremely simple to produce. A fantastic discussion stimulus for exploring the meaning of concepts and for developing the skill of evaluation in a different way. Pictured is an example to explore the meaning of "friendship". meaning of FRIENDSHIP and why? Now think for a moment which one you would choose. It's probably quite easy to highlight the connection between friendship and any one of the pictures, e.g. Picture 2 - "friends help each other out", but this is NOT the activity. The activity is to identify the ONE image that, given all that you know about friendship, best encapsulates that concept. You are required to evaluate them all against this criterion, choose one and justify your choice. 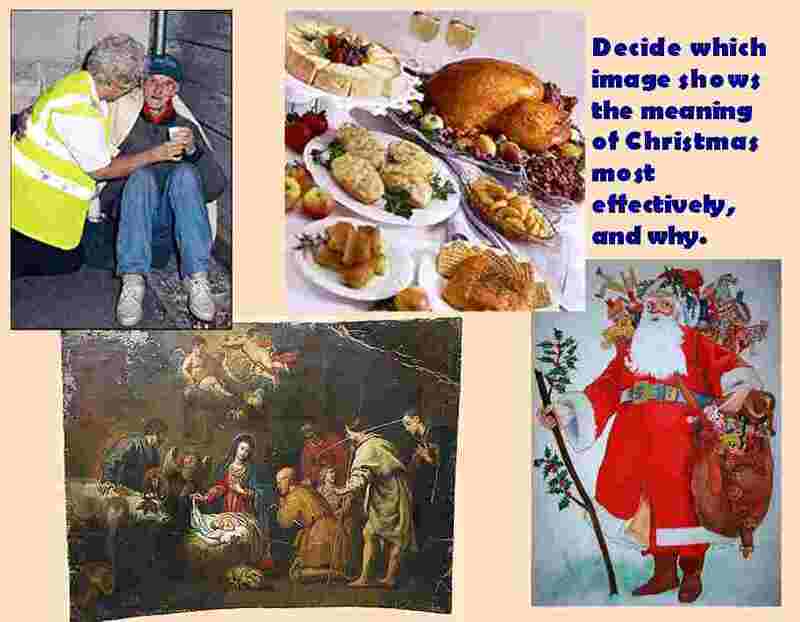 meaning of CHRISTMAS and why? This can be a powerful way to draw out and challenge misconceptions about the concept at hand, be it "friendship", "globalisation", "honesty", "efficiency", "respect", "expectation"...anything. Even Christmas! Of course, the four or five stimuli don't have to be images: they might be pieces of music, poetry, art, dance movements, etc. In class we were studying the story 'The 3 Billy Goat's Gruff'. This was used to investigate the characters for the top ability groups. Children in small groups were given pictures of each character (Little Billy Goat, Middle Billy Goat, Big Billy Goat and the Troll). Children had to decide which image best shows a sneaky character. Children made their choices and were then prompted to discuss their reasons with their group and an adult. Children then recorded their answers using the words 'I think' and 'because'. Children were quick to find which character was the sneakiest but needed prompting to give a reason (Why do you think it's the sneakiest?). Top ability children completed this activity well but needed adult support to explore and discuss their ideas further. Children could record ideas unaided. How did you adapt this tool for your classroom? What was the response from your learners? What advice would you give other teachers about this tool? These teaching and learning techniques are suitable for most age groups and subjects. They have been selected as examples of techniques that are supportive of the five elements of narrow gap classrooms, i.e. where the attainment gap between the more and less confident learners is minimised. Want an email when new techniques are added? (c) 2017 Narrowing the Gaps Ltd. Simple theme. Powered by Blogger.